(Nanowerk News) Cartilage is flexible connective tissue found in places such as in joints and between vertebrae in the spine. Compared to other types of connective tissue is not easy to repair. The researchers from Imperial College London and the University of Milano-Bicocca have developed a bio-glass material that mimics the shock-absorbing and load bearing qualities of real cartilage. It can be formulated to exhibit different properties, and they are now hoping to use it to develop implants for replacing damaged cartilage discs between vertebrae. They believe it also has the potential to encourage cartilage cells to grow in knees, which has previously not been possible with conventional methods. The bio-glass consists of silica and a plastic or polymer called polycaprolactone. It displays cartilage-like properties including being flexible, strong, durable and resilient. It can be made in a biodegradable ink form, enabling the researchers to 3D print it into structures that encourage cartilage cells in the knee to form and grow – a process that they have demonstrated in test tubes. It also displays self-healing properties when it gets damaged, which could make it a more resilient and reliable implant, and easier to 3D print when it is in ink form. One formulation developed by the team could provide an alternative treatment for patients who have damaged their intervertebral discs. When cartilage degenerates in the spine it leaves patients with debilitating pain and current treatment involves fusing the vertebrae together. This reduces a patient’s mobility. The scientists believe they will be able to engineer synthetic bio-glass cartilage disc implants, which would have the same mechanical properties as real cartilage, but which would not need the metal and plastic devices that are currently available. Another formulation could improve treatments for those with damaged cartilage in their knee, say the team. Surgeons can currently create scar-like tissue to repair damaged cartilage, but ultimately most patients have to have joint replacements, which reduces mobility. The team are aiming to ‘print’ tiny, biodegradable scaffolds using their bio-glass ink. These bio-degradable scaffolds would provide a template that replicates the structure of real cartilage in the knee. When implanted, the combination of the structure, stiffness and chemistry of the bio-glass would encourage cartilage cells to grow through microscopic pores. The idea is that over time the scaffold would degrade safely in the body, leaving new cartilage in its place that has similar mechanical properties to the original cartilage. Professor Julian Jones, one of the developers of the bio-glass from the Department of Materials at Imperial, said: “Bio-glass has been around since the 1960’s, originally developed around the time of the Vietnam War to help heal bones of veterans, which were damaged in conflict. Our research shows that a new flexible version of this material could be used as cartilage-like material. The researchers have received funding from the Engineering and Physical Sciences Research Council to take their technology to the next stage. They are aiming to conduct trials in the lab with the technology and develop a surgical method for inserting the implants. They will also work with a range of industrial partners to further develop the 3D manufacturing techniques. Professor Justin Cobb is the Chair in Orthopaedic Surgery at Imperial’s Department of Medicine. He will be co-leading on the next stage of the research. 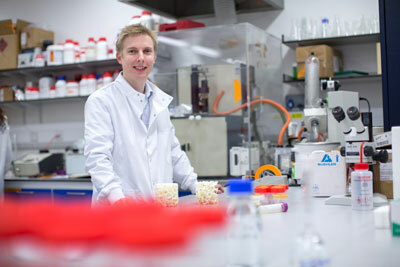 Professor Cobb added: “This novel formulation and method of manufacture will allow Julian and his team to develop the next generation of biomaterials. Today, the best performing artificial joints are more than a thousand times stiffer than normal cartilage. While they work very well, the promise of a novel class of bearing material that is close to nature and can be 3D printed is really exciting. Professor Laura Cipolla, from the Department of Biotechnology and Biosciences at the University of Milano-Bicocca, added: “Based on our background on the chemical modification of bio- and nanostructured materials, proteins, and carbohydrates, we designed a new chemical approach in order to force the organic component polycaprolactone to stay together in a stable way with the inorganic component silica." The team also includes PhD student Francesca Tallia from Imperial’s Department of Materials and senior researcher Laura Russo, from the Department of Biotechnology and Biosciences at the University of Milano-Bicocca. The technology still has a number of regulatory hurdles to overcome before it reaches clinical applications for both applications. The team predict it will take ten years to for both technologies to reach the market. They have patented the technology with Imperial Innovations – the College’s technology commercialisation partner.